In diesen Tagen sehen wir viele Chanukkaleuchter – im Haus, in der Synagoge, im Web … ganz besonders beeindruckend aber ist jener auf den Asphalt projizierte Leuchter zwischen Holocaust-Denkmal und dem vergangene Woche neu eröffneten Museum Judenplatz in Wien (leider hatte ich nur mein Handy dabei). Es handelt sich dabei um eine bosnische Chanukkia aus der Sammlung Max Berger, die übrigens im Original in der Ausstellung „Die Türken in Wien“ im jüdischen Museum der Stadt Wien zu sehen ist (noch bis 09. Jänner 2011). Umgesetzt wurde die Lichtprojektion von Michaela Feurstein (jüdisches Museum der Stadt Wien). Tipp: Auch wenn es derzeit bitterkalt ist, ein Spaziergang zum Judenplatz in Wien zahlt sich insbesondere abends, in der Dunkelheit, schon alleine wegen der wunderbaren Projektion wirklich aus! ein fröhliches Chanukkafest – Happy Chanukka – חג אורים שמח! Here are for the readers the battles and the miracle from that period. It was in the second century BCE, at the time when Jerusalem and Judea were under Greek-Syrian rule. The Greeks wanted to Hellenize the people under their rule, this included the Jews. They enforced laws that were against Jewish religious laws and customs. The learning of the TORA (The Mosaic books), circumcision, keeping the Shabat were forbidden and punishable. Worship of the Greek God Zeus, whose statue was put in the Jewish Temple in Jerusalem, was compulsory, and eating pork was reinforced. 2. The finding of just one sealed container of oil, with enough oil to light the candlestick in the Temple for one day, but by miracle it burned for eight days. The second event is self explanatory – miracle. To elaborate the first event, the following is the history of that period, recorded by the historian Josephus Flavius in his book „Antiquities of the Jews“. At this time there was one whose name was Matityahu, from Modiin, the son of Johanan, the son of Shimeon, the son of Hashmonai, a priest of the order of Jhoyariv, and a citizen of Jerusalem. He had five sons; Johanan, Shimon, Yehuda (Judas), Elazar, and Jonathan. The Greek soldiers that were appointed by the king came to Modiin, and asked Matityahu, a respectable citizen, to offer sacrifice to the idol, as the king had commanded, but Matityahu said he would not do it. But one Jew from the midst of the crowd came forward and sacrificed, as Antiochus had ordered. Seeing that, Matityahu ran to him and slew with his sword both the man that sacrificed, and Apelles the king’s general, who compelled them to sacrifice. He also overthrew the idol altar, and then he, with his sons, escaped to the desert. When the king’s generals heard this, they took all the forces they had in the citadel at Jerusalem, and pursued the Jews into the desert. When Matityahu died his son Yehuda succeeded him. He took it upon himself to purify the land of all the pollutions that were in it and expel his enemies from the country. When Apollonius, the general of the Samaritan forces heard this, he took his army to eliminate Yehuda. Yehuda confronted him in battle, beat him, and killed many of his men, among them Apollonius himself whose sword he kept for himself. When Seron, the commander of the Syrian army heard that many had joined Yehuda, and that he had now an army sufficient for fighting, he determined to make an expedition against him. He got together an army, as large as he was able to build up. He came to Beth Horon, a village in Judea, and put up his camp there. Yehuda confronted Seron and defeated the Syrians. When eight hundred of them were killed, and their general fell in battle, the rest of the army ran away. When King Antiochus heard of these things, he was very angry at what had happened. He appointed Lysias and gave him a part of his forces and of his elephants. He ordered him that he should conquer Judea and take its inhabitants for slaves, destroy Jerusalem, and abolish the whole nation. The enemy sent Georgias, with five thousand foot soldiers and one thousand horsemen, to engage Yehuda at night in his own camp. Now that their forces were divided Yehuda decided a surprise attack on the sitting enemy that remained in the camp in Emmaus. He left many fires in his own camp so that the enemy should think that his forces are still there, and marched all night to Emmaus. When Georgias reached Yehuda’s camp and found it empty, he suspected that they had hidden themselves and decided to search for them. At day break Yehuda reached Emmaus, with only three thousand men. He saw the enemy very well fortified in their camp and commanded the trumpeters to sound the call for battle. He made a surprise attack on the enemy, pursuing them as far as Gezer, and the plains of Yahud, and Ashdod, and Yavne. The loss of the enemy amounted to about three thousand dead. Yehuda ordered his soldiers not to go after the spoils, as they still have to confront Georgias and his army. As he was speaking to his soldiers, Georgias‘ men looked down into their camp at Emmaus and saw that it was overrun and burnt. They decided not to fight and retreated. Lysias saw the defeat of the army which he had sent, and the following year he put together an even larger one of sixty thousand chosen men and five thousand horsemen. This army was sent to fight Judea. The army reached the hill country of Beth Tzur, a village in Judea, and camped there. Yehuda met him there with ten thousand men. At the first assault Yehuda beat them, and caused his enemy about five thousand dead. When Lysias saw the great spirit of the Jews, he took the rest of his army and returned to Antioch. Yehuda assembled the people and told them, that after these many victories which God had given them, they ought to go up to Jerusalem, and purify the Temple. When he came to Jerusalem he found the Temple deserted and its gates burnt down. He started to purify the Temple, brought in new vessels, the candlestick, the table, the altar and restored the doors. On the five and twentieth day of the month of Kislev, which the Macedonians call Apeliens, they lighted the lamps that were on the candlestick, offered incense upon the altar, laid the loaves upon the table and offered burnt-offerings upon the new altar. Yehuda celebrated the festival of the restoration of the sacrifices in the Temple for eight days. They were so glad at the revival of their customs, and regaining the freedom of their worship, that they made it a law that they should keep a festival, on account of the restoration of their Temple worship, for eight days. And from that time to this we celebrate this festival, and call it the Festival of Lights. Even after the restoration of the Temple the battles continued. At the battle of Bet-Zeharia, Yehuda’s brother, Elazar, was killed as he stabbed a Greek war elephant. Nicanor’s army was destroyed and he himself was killed. On receipt of the news of Nicanor’s defeat Demetrius I Soter, son of Seleucus IV Philopator and nephew of the late Antiochus IV Epiphanes, dispatched a new army, commanded by Bacchides. This time the Syrian forces of 20,000 men were numerically superior, however, Yehuda decided to engage them in battle. In the Battle of Elasa (160 BCE), Yehuda fell in battle. He was buried in the family sepulchre at Modiin. After the death of Yehuda, and after several additional years of war under the leadership of two of Matityahu’s other sons (Jonathan and Shimon), the Jews finally achieved independence and liberty to worship freely. For Hanuka we have the Hanukia. Beside it there is another custom, Dreidl (סביבון) and Hanuka Geld (מעות חנוכה). Can anyone enlighten us how did they become part of the Hanuka customs? At the time of the Jewish Revolt the Greek soldiers were searching all the time for the Jewish army commanders. The Jewish army officers, while in conference, had a Dreidl on the table and some money. Whenever they were interrupted by the Greeks, they turned to gambling. If we accept this story, we can explain by it the custom of playing cards during Hanuka. This is the story of card playing by Jews in Burgenland. The Rabbi of Eisenstadt Rabbi Meir Eisenstadt (1670-1744) (מהר“ם א“ש) issued a decree on 30 April, 1730 prohibiting playing cards in his and the neighboring communities. The playing of cards was permitted to women giving birth and during Hanuka. The head of the community (ראש הקהל) announced the permission to play cards at the beginning of Hanuka and announced the prohibition at Hanuka end. As Hanuka is just 8 days, preparations were made weeks ahead for the houses and the times where the playing of cards will be conducted. There was rarely a table left which was not covered by Playing Cards during Hanuka. This custom was kept by the communities till their destruction after the Anschluss. Did anyone hear that story? Or any other story about this custom? I am thankful that Johannes decided to put Hahuka on the Blog. I was quite surprised to see the display in light, in Vienna, of a Hanukia, which I understand will be displayed during the 8 days of the Jewish fesival. Is it a yearly event or just a one time one? 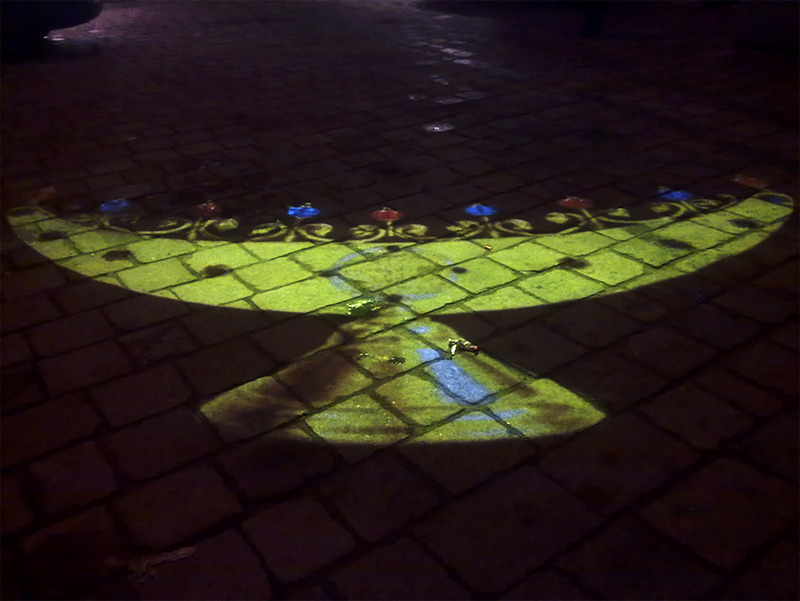 I understand that there is also a daily public lightning of the Hanukia by the Lubawich at Stephansplatz 1 in Vienna. ich denke, dass die Chanukkia bis Donnerstag gezeigt wird, weiß aber nicht, ob sie auch nächstes Jahr wieder geplant ist. Hoffentlich! Sie können unsere Beiträge auf Facebook auch sehen, wenn Sie keinen eigenen Account haben! Ich möchte mich sehr herzlich für diesen Blog bedanken. Diese Seite hier ist meine Informationsquelle Nr. 1 über jüdische Geschehnisse in Österreich! Lieber Dominik, wir bedanken uns bei Ihnen sehr herzlich für Ihr so nettes Feedback! Ist wirklich wichtig für uns und motiviert uns auch weiterhin!